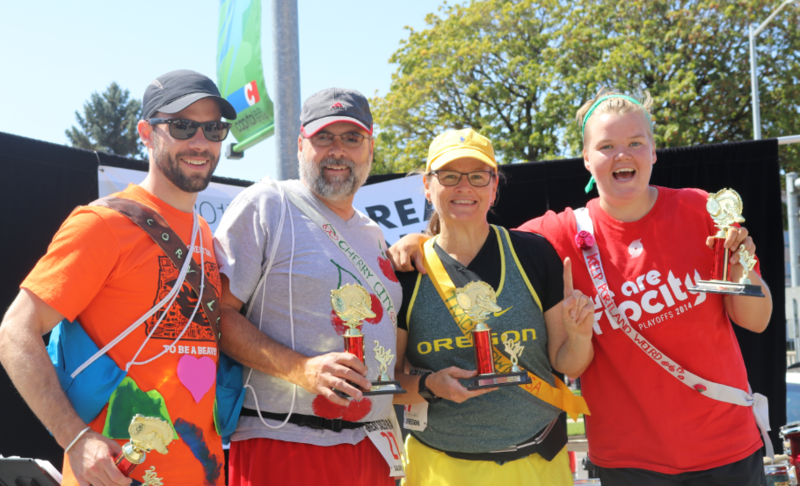 Click here to register for this year’s Great Salem Race on August 18. Don’t miss out on the fun! 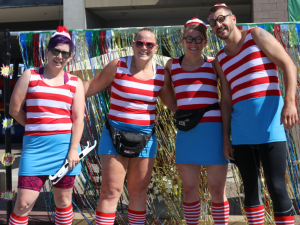 Over one hundred people gathered at the Salem Convention Center on Saturday, August 19, to participate in the seventh annual Great Salem Race. 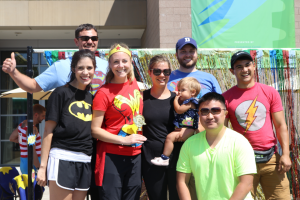 42 teams dressed in costumes raced to solve clues, complete challenges and have fun at the event hosted by the Salem Area Young Professionals. Group photo before the race! The Great Salem Race is the ultimate Salem scavenger hunt and team building experience. Open to all ages, teams of two to four received a list of clues which led them to local businesses in downtown Salem. Traveling only on foot, each team had to complete challenges such as filtering water or performing a monologue before receiving a stamp for their completion. After visiting all locations, teams traveled back to the Convention Center to cross the finish line and enjoy post-race festivities. 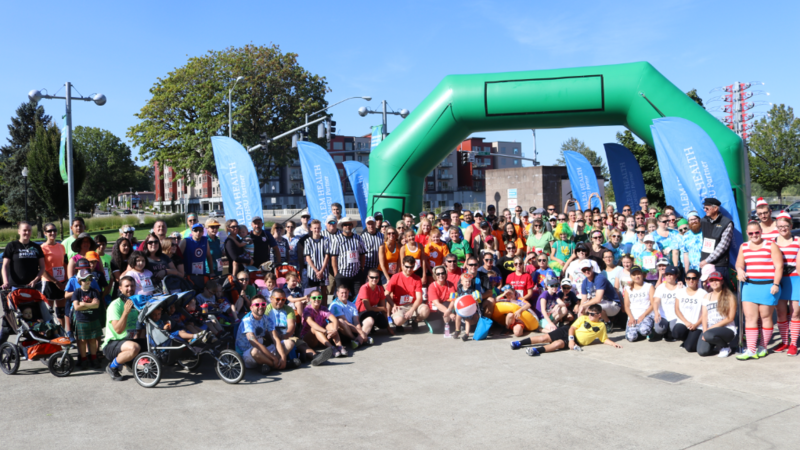 “This is an affordable, family-friendly, action-packed event downtown that brings families and businesses together,” said Morgan Sund, chair of the planning team. “After being involved last year in the planning of the Great Salem Race, there was no way I would stand back and not participate this year.” Sund is on the leadership team of Salem Young Professionals, a program of the Inspire Foundation that exists to connect professionals in their 20s and 30s and provide professional development opportunities. member’s costume represented a different city in Oregon: Corvallis, Eugene, Portland, and Salem. Taking second place and winning best costume was Where’d They Go? clocking in at 59:35 and dressed in candy cane stripes as Waldo from “Where’s Waldo?”. Finishing only 20 seconds later, West Salem Foursquare finished at 59:55. Team Emoji won the family division with a time of 1:01:49. This team of four was familiar with the victory circle after taking second place last year. The Flying Platy-Pi took second place with 1:10:09 followed by The Acosta Avenger taking third at 1:11:24. 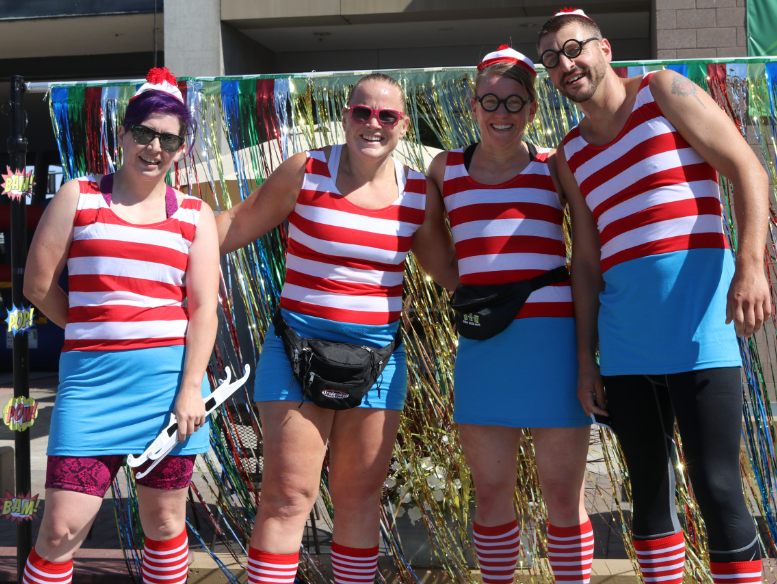 Team “Where’s Waldo” won the costume contest! Be sure to check out the Facebook page for more wacky costumes. graduates, kept the scene lively by playing covers of popular songs. Salem Health was the title sponsor for the event this year. “The Great Salem Race encourages families and friends to be active and see their community in a new way,” explained Bryce Petersen, community relations liaison for the hospital. 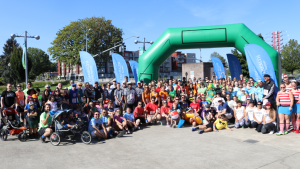 “Salem Health is proud to sponsor events like the Great Salem Race that promote healthy and active lifestyles.” Other sponsors were B2 Taphouse, Salem Electric and the Ike Box. Salem Young Pros team that put on the event. Clue locations included Exitus Escape Rooms, which ended up being one of the more difficult parts of the Great Salem Race, and the Peter Courtney Minto Island Bridge, where the Salem Leadership Foundation was located. Other locations included: Salem Creative Network, Salem Summit Company, Taproot, the Verona Studio, Willamette Valley Kitchen Company, Willamette Valley Music Company, Willson Park at the Capitol, and the YMCA. Check out more photos from the day on Facebook here! The Great Salem Race is an event planned by Salem Young Professionals in partnership with the Salem Leadership Foundation.